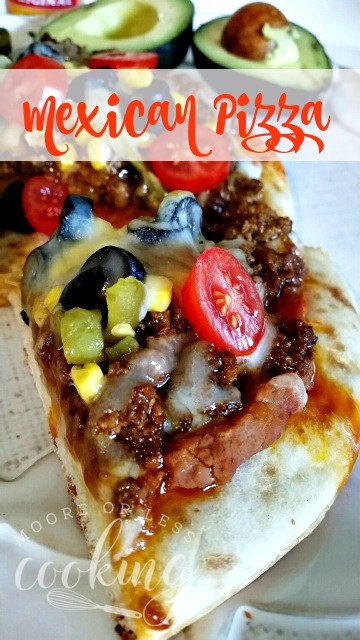 Mexican Pizza: Turn any night into Mexican Night with this delicious layered pizza!! 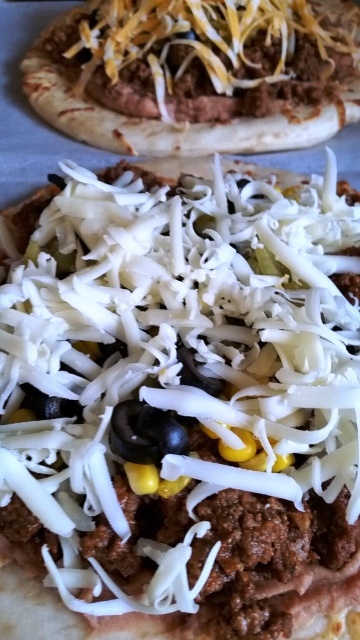 It’s a cinch to put together this Mexican beef, refried beans, veggies, and loaded cheese pizza! 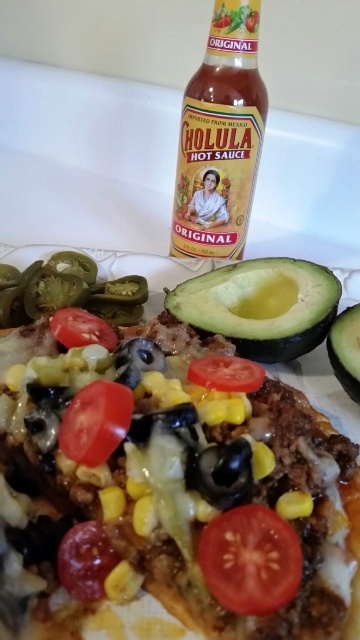 Just have your ingredients ready and be hungry for a flavorful fiesta! I have to say that pizza is the most popular food group at my house. Why yes, it is a major food group. Having mastered pizza dough, and yet not planning accordingly, I used a shortcut using Single serve Boboli Pizza crusts. I have never used them before in cooking and was surprised by how delicious they are and time saving. 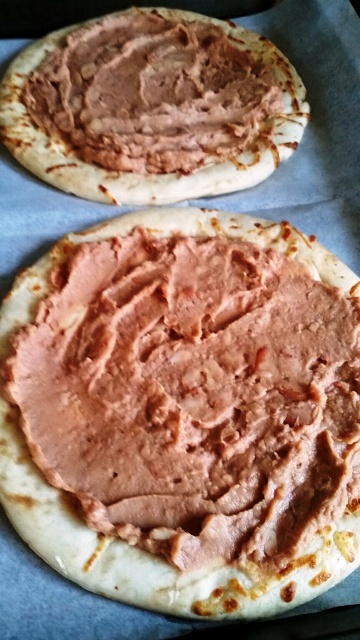 These pizzas can also be made with pre-made pizza dough or with tortillas. I have made pizza with all of these types of pizza crusts and they are wonderful! The fantastic thing about pizza is that you can add anything to your crust. The crust is just a vehicle to help hold it and eat it! 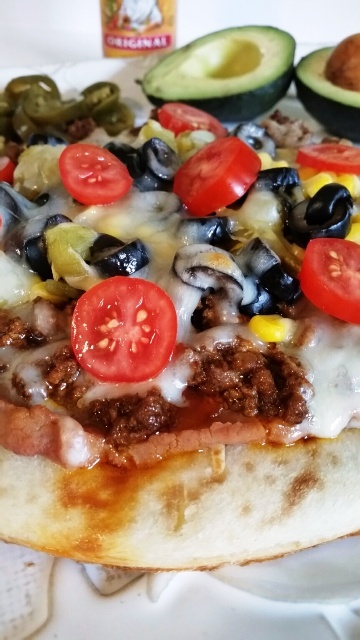 Also, for this pizza, I added my favorite toppings: Mexican ground beef, refried beans, corn, lots of cheese, green chiles, black olives, tomatoes, avocados, salsa, and Cholula Sauce.Wow! My family loved it and it had quickly vanished. Spread a layer of beans over pizza crust. 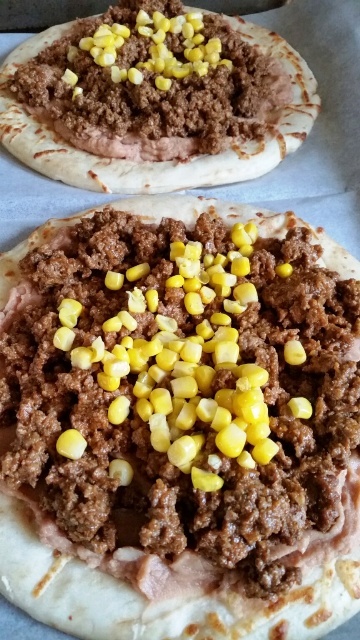 Spread a layer of ground beef, then a layer of corn. Spread a layer of olives. 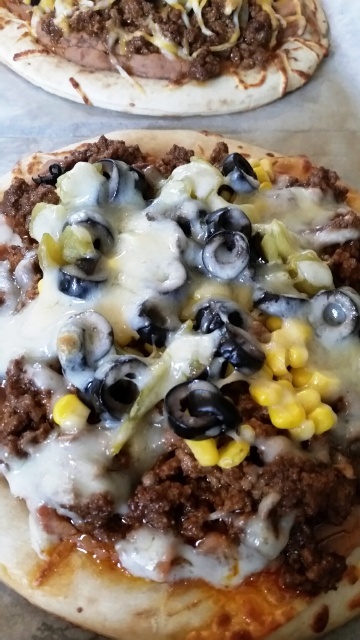 Sprinkle cheese and green chiles all over pizza. Bake until cheese is melty and ooey gooey. Top with tomatoes. Garnish with salsa, jalapenos, and avocado. 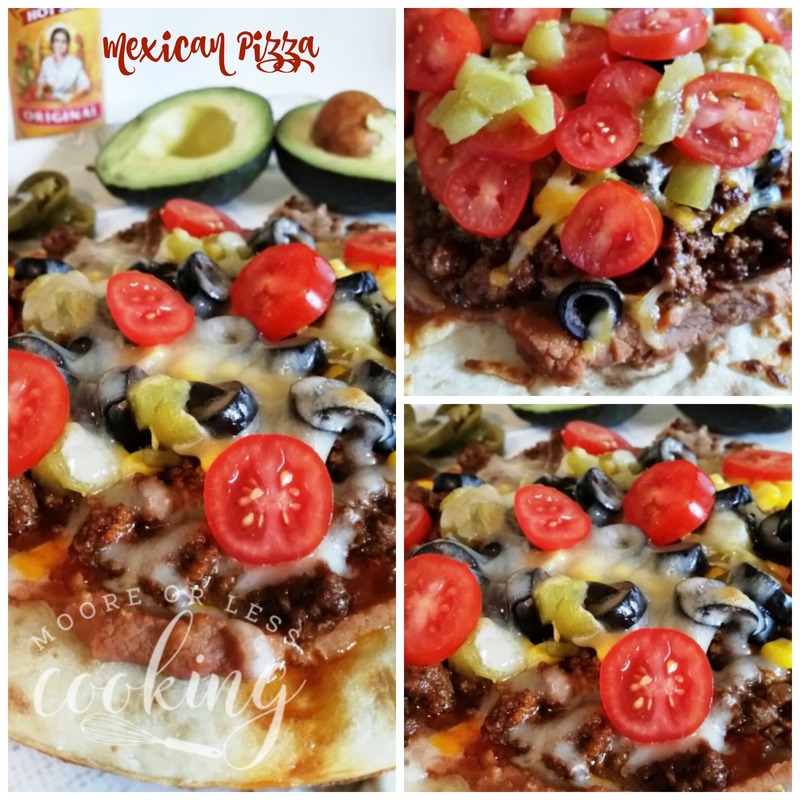 Turn taco night into Mexican Pizza Night! 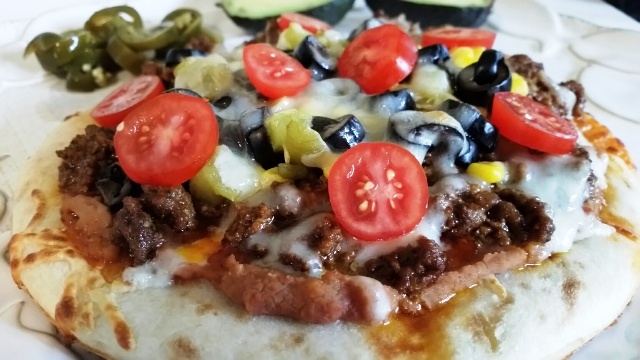 Layers of ground beef, refried beans loads of veggies make this pizza a hit! Brown ground beef in a skillet on medium heat, drain fat. Add seasonings and a ¼ cup of water. Cook until all water has cooked off. Lay pizza crusts on a foil-lined baking sheet. Cover with a layer of refried beans. Spread the ground beef over refried beans. Sprinkle corn and then green chiles over beans. Cover each pizza with half of the Cheddar and Monterey Jack cheeses. Place tomatoes and jalapenos on each pizza. Place pizzas in the oven, and bake for 5 to 10 minutes, or until the cheese is melted. Remove from the oven, and let cool slightly before cutting in half. 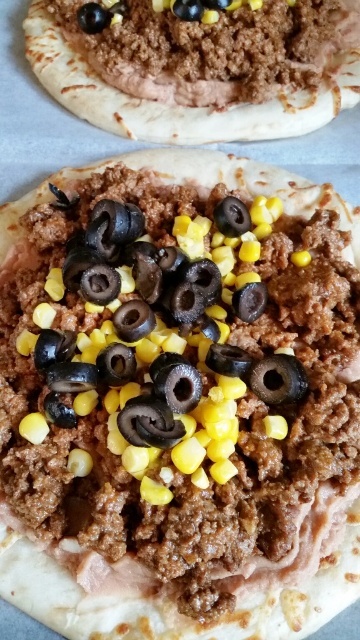 What a unique take on pizza! Definitely trying this. 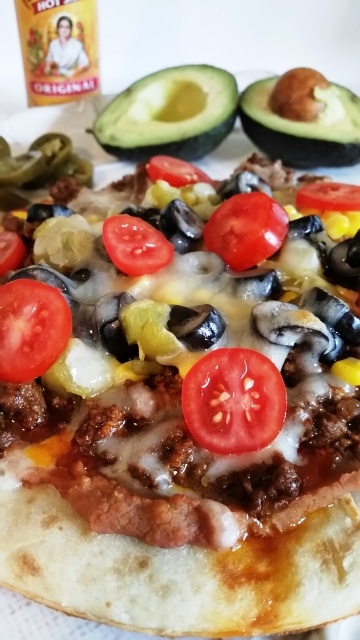 This reminds me of the taco pizzas we used to eat in high school—except your toppings look even better! What a fun pizza! Your toppings look amazing even though you had me at the avocado. That is one delicious loaded pizza! Anything Mexican is delicious in my book.